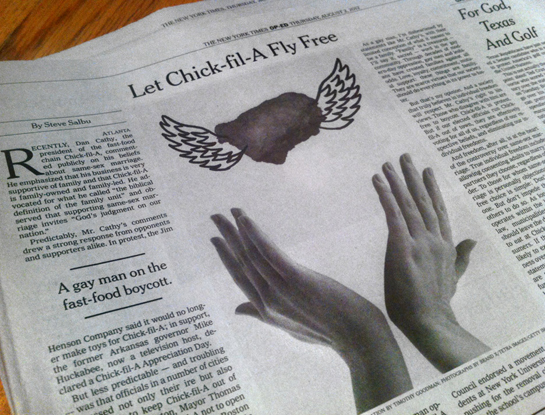 Designer, Illustrator and Art Director Timothy Goodman (YG7) recently did an illustration for a New York times op-ed about the recent controversy surrounding Chick-fil-A and it’s stance on gay marriage. Timothy had this to say, "The fact that “freedom” and “gay marriage” are still incomparable is enough to make one sick—but now we’re throwin’ fried chicken in the mix? I need an In-N-Out burger immediately."